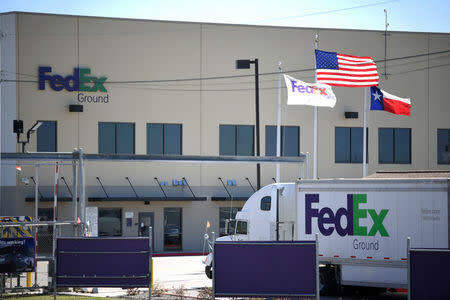 AUSTIN/SCHERTZ, Texas (Reuters) - A package bomb blew up at a FedEx distribution centre near San Antonio on Tuesday, the fifth in a series of attacks that have rocked Texas this month and left baffled investigators searching for what they suspect is a serial bomber. The package filled with nails and metal shrapnel was mailed from Austin to another address in Austin and passed through a sorting centre in Schertz, about 65 miles (105 km) away, when it exploded on a conveyer belt, knocking a female employee off her feet, officials said. A further package sent by the same person was discovered and turned over to law enforcement, FedEx Corp <FDX.N> said in a statement on Tuesday. The first three devices were parcel bombs dropped off in front of homes in different Austin neighbourhoods. The fourth went off on Sunday night on the west side of the city and was described by police as a more sophisticated device detonated through a trip wire.